The immediate exchange of real-time health information online has allowed health care consumers and patients to share valuable experiences and to gain knowledge. Online communities provide a valuable resource for individuals to seek reassurance, form relationships, establish trust, communicate and connect with others with similar experiences. 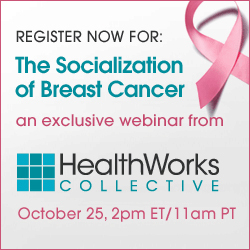 October is Breast Cancer Awareness Month and HealthWorksCollective will host an exclusive live webinar, “The Socialization of Breast Cancer” on October 25, 2011 at 2 p.m. EST / 11 a.m. PST. I am delighted to be the moderator of a distinguished panel of guests. We will talk about the growing role of social media in educating breast cancer patients and connecting them with the treatment resources that they need. Thousands of websites and social media channels now provide fast information to women seeking information about breast cancer. Has this deluge of data helped or hindered? How can women and their families feel confident that what they are reading on the Internet is fact and not fiction? How can medical professionals use social media to optimize treatment and build stronger relationships with patients? How to engage with breast cancer support groups online. Best online resources for breast cancer patients and treatment providers. Learning from breast cancer: Best practices for medical education and communication. How has the conversation between doctor and patient changed? I hope you will be able to join us for this free webinar. If you are interested, you may register here. Lillie Shockney is the Director of the Johns Hopkins Breast Center. She is an RN, with a BS in healthcare administration, and a Masters in Administrative Science of the Johns Hopkins University. She is also a 2 time breast cancer survivor. She was appointed to a distinguished service faculty chair in the School of Medicine in 2008 by the Medical Board and Board of Trustees of Johns Hopkins. She is an Associate Professor in the School of Medicine, within the depts. of surgery, gynecology and oncology. She has written 14 books and more than 200 published articles on breast cancer. She is the editor in chief of a new medical peer review journal on oncology navigation and survivorship. Over the past 14 years she has received 35 national awards and 4 state awards for her work in the breast cancer field. Elyse Spatz Caplan, a 20-year breast cancer survivor, joined the non-profit organization Living Beyond Breast Cancer in 2000. In her current role of Director of Programs and Partnerships, she oversees LBBC’s educational programming for breast cancer information and awareness, including large-scale national conferences and teleconferences, the toll-free Survivors’ Helpline, written and online publications, networking programs, workshops, and trainings for healthcare professionals. She also works with other organizations to form partnerships that will extend the reach and depth of LBBC’s services. Since joining LBBC, Elyse has helped expand the educational programming in both size and breadth. She is responsible for structuring and organizing new educational initiatives, including programs for women with metastatic breast cancer. Andrew Schorr has been a medical journalist for 30 years. In that time he has interviewed hundreds of breast cancer patients – even men – and medical specialists. Along the way Andrew became a cancer patient too – treated successfully for leukemia 11 years ago. Andrew has been a pioneer in online discussions about serious health issues having founded HealthTalk.com and more recently, PatientPower.info. Andrew is the author of the new book, “The Web-Savvy Patient,” covered in a recent report by Jane Brody in her New York Times personal health column. Barbara Ficarra, RN, BSN, MPA is an award-winning journalist, medical blogger, freelance writer, media broadcaster, speaker, consultant, health educator and registered nurse. She is founder and Editor-in-Chief of Healthin30.com. Barbara is a featured writer at The Huffington Post and she is on the Editorial Advisory Board and consumer health educator for ShareCare. Barbara is a consultant for Numera Health | Numera Social as Senior Director Clinical Affairs. Barbara is on the front lines of health care. She is an Administrative Head Nurse (Administrative Supervisor) at a large university medical center and covers multiple medical and surgical units, critical care and women’s and children’s services. She is multifaceted in her clinical experience, ranging from oncology to general medicine and surgery. HealthWorksCollective is owned and managed by Social Media Today, LLC. I would love to attend the Webinar, but I cannot discover how to register. Hi Barbara, this seems like such a valuable on-topic event. We are sorry to have missed it. So to keep with the social media theme (tongue in cheek) is there a podcast or some Youtube re-broadcast of this webinar?